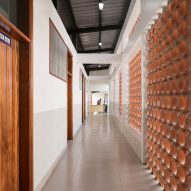 HKS Architects and Engineers for Overseas Development have built a maternity unit in Uganda, using local materials, skills and technology to create a sustainable facility. The 275-square-metre Kachumbala Maternity Unit, which opened six months ago, can accommodate up to six births a day and offers hugely improved aftercare facilities to the town of Kachumbala. 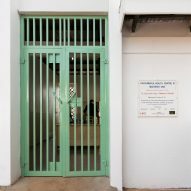 The building replaces a ward that comprised of just two rooms built in the 1950s, which served a population of 160,000, in an area that lacks a reliable source of water or electricity. Midwives were having to process paperwork in the same rooms as medical procedures, and only 40 per cent of expectant mothers in the district could access the facilities. Home births here are risky, and infant mortality rates in the region are high. "It was about increasing the capacity of the centre, making an environment that was suitable, which was a lot more pleasant, had a degree of privacy, which kept the harsh sun off, and which used passive deign methods to motivate air flow," HKS Architects design director Dan Flower told Dezeen. Kachumbala has a hot and particularly dry climate. In order to suit its environment, the new birth centre had to be entirely passive and self sufficient, able to generate its own power, collect its own water, and keep the rooms comfortably cool without air conditioning. The new unit generates its own power from solar panels, and collects rainwater runoff from the roofs in tanks to create its own water supply. "It was very important not to import any alien technologies, mainly because they fail. We've tried it on previous projects, and they don't work," explained Flower. "We tried to understand local process, practice, and what was possible." Terracotta screens, a feature found in local architecture, were added to external walls to allow light and air flow through the building while being self-shading. "It's a local clay, it's got that beautiful red marum colour to it. It really grounds the project in its place," said Flower. "I think it produced quite a beautiful architecture." Bricks were handmade on site, using a press block machine developed at a Ugandan university. Apprentices from Cyfle Building Skills helped train local labourers in the technology. This construction material is less environmentally destructive than traditional clay fired bricks, which require significant local deforestation to make. "It was a responsible way of using a local material and a local workforce, transferring a skill, teaching a skill, and the output is blocks you can use for the building," added Flower. All materials were sourced as locally as possible, with hollow breeze blocks used as columns to extend the building's span and tiles used for the floors. "In the UK we would never use tiles [in a medical facility], we'd always use a seamless surface, but they just don't exist in Uganda," explained Flower. "There, tiled floors are the absolute Rolls Royce of facilities." "A mono-pitched roof allowed us to create a delivery room that sits as a kind of shell inside under the building, which keeps it a lot cooler and allows air to pass over it and out the other side," he said. 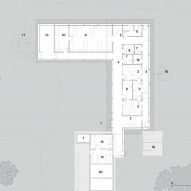 The new maternity unit layout separates all the existing functions, with a separate reception, two delivery suites supported by a dividing sluice room, and an open plan observation ward. A bay was also added to provide cooking and washing facilities for female family members who come to support expectant and new mothers. HKS Architects fundraised to finish the project and equip it with things such as the medical fridge for the onsite pharmacy, which is specially designed to cope with intermittent power. "It became an entire little ecosystem that was meant to self support and collect its own water. It is also connected to the mains, for when there's a dry season and there are no rains to collect, but the majority of the time it can effectively run as a net zero building," said Flower. The global architecture firm sent out it's own staff to volunteer with the build, alongside skilled apprentices from south Wales. Construction workers were employed from local families, and the project was part of a prolonged engagement with women's cooperatives in district. 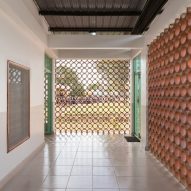 In Senegal, Swiss studio Manuel Herz Architects is planning to extend a hospital near the border with Mail to include a new maternity ward, using curving walls of perforated brick to allow cooling air to circulate. Dutch design studio Super Local has worked with craftsmen in Malawi to create affordable hospital equipment that can be made locally, rather than expensively imported.